Help FireBoy and WaterGirl in this new adventure! 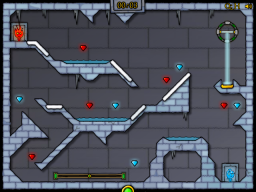 Control both characters at the same time to solve platformer puzzles! Direct light beams to freeze and melt water, activate buttons and levers to move platforms, push boxes and roll balls, collect all the diamonds and get each character to his door!